Back in the late summer we made the decision to maybe move out to the country. 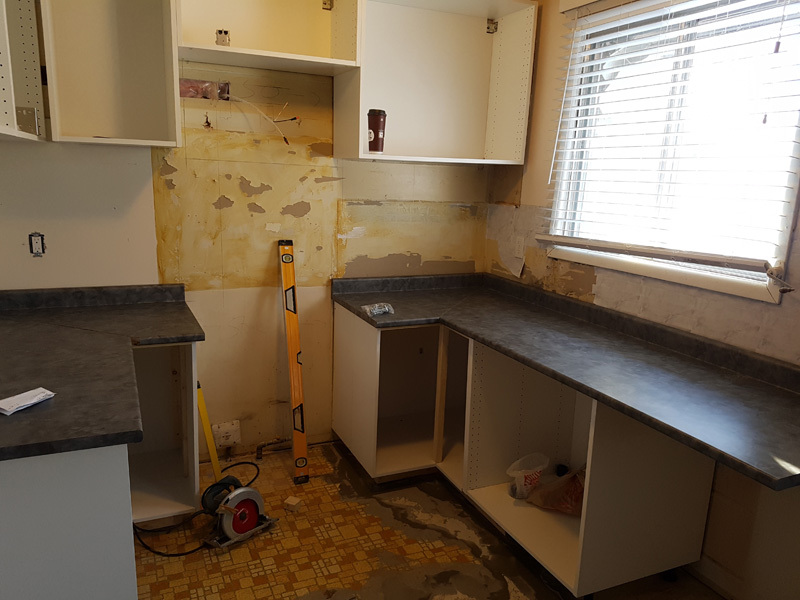 After a few months of things not working out, we decided maybe it would be a better option to stay and just do renos on the things we didn’t like. And it turned out to be the right choice. 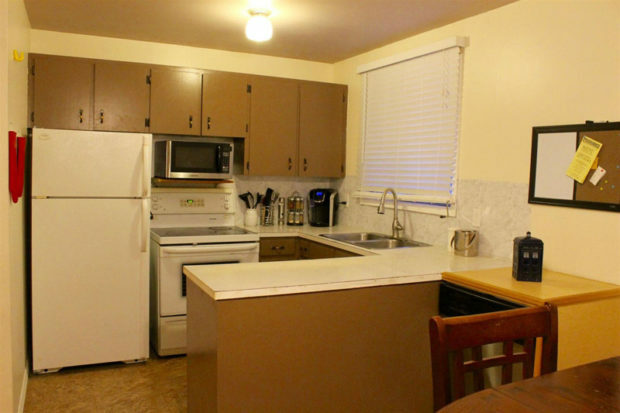 The 2 main areas we wanted to renovate were the kitchen and living room. 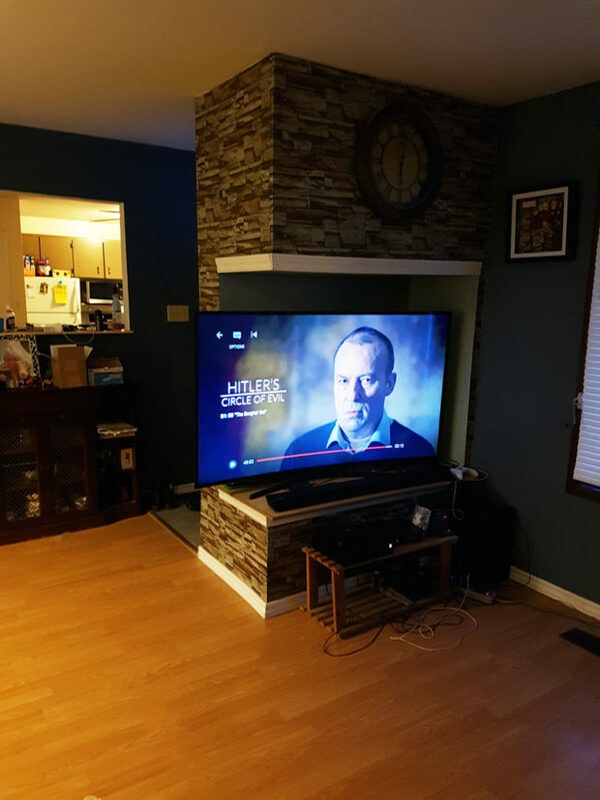 We also decided to build me a studio in the basement, but that’s to topic for another blog. 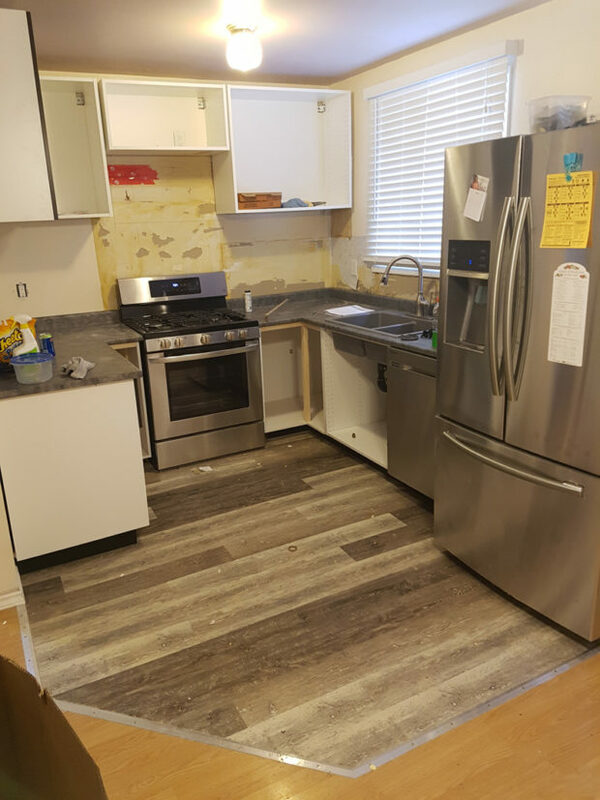 Here are the before photos of our kitchen and the parts of the living room we wanted to update. 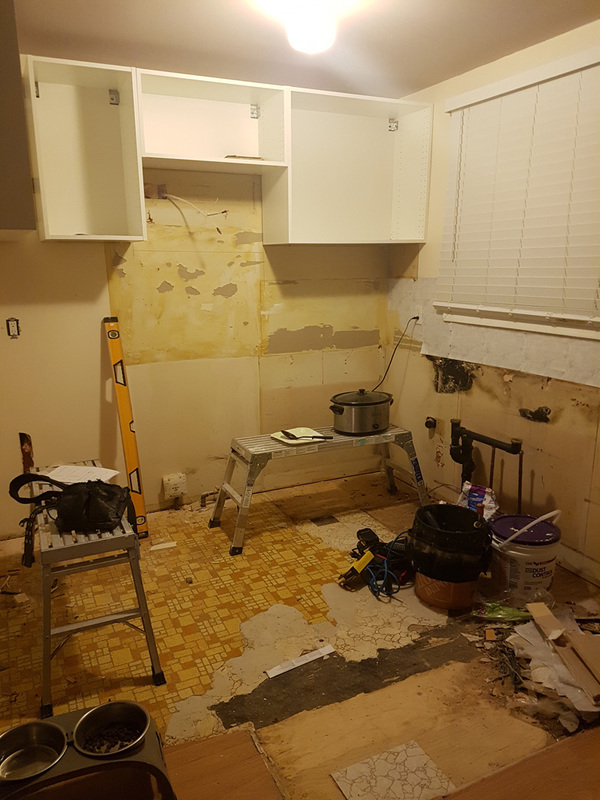 So we found a contractor to do the work and set to starting our renos. First off, we ordered cabinets from Ikea, which was an awesome process. They have a planner with 3D views, and it puts together a big list of all the parts and everything. Then they call to verify you have everything you need. It made it super simple and overall was pretty cheap and worked out well. I would totally go thru them again. And it’s not like we didn’t try local, because we did, but the actual local business here was a beyond awful experience, and Home Depot was a joke. So Ikea it was and I think it was the better choice anyway. Our house became a hoarders dream, with everything from our kitchen moved into our spare room and computer room. 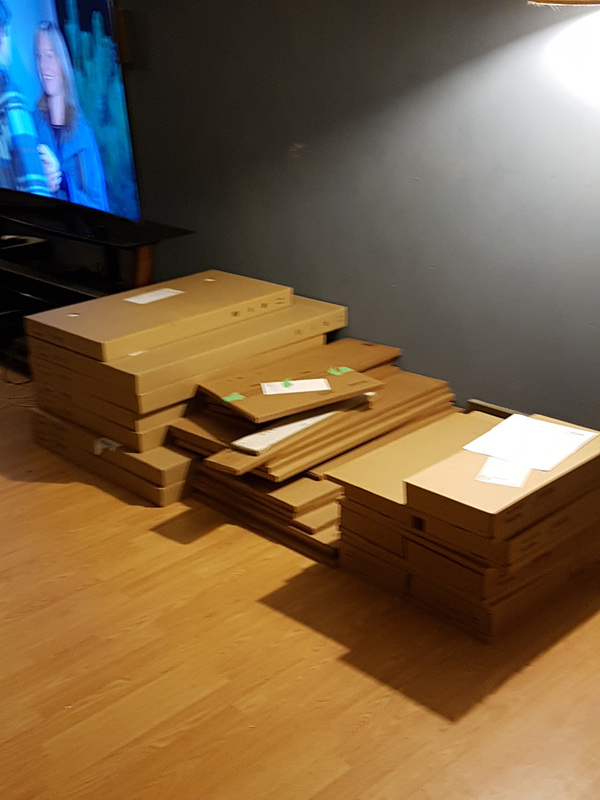 And we got our delivery of the giant pile of boxes, over 70, and set to work building them. 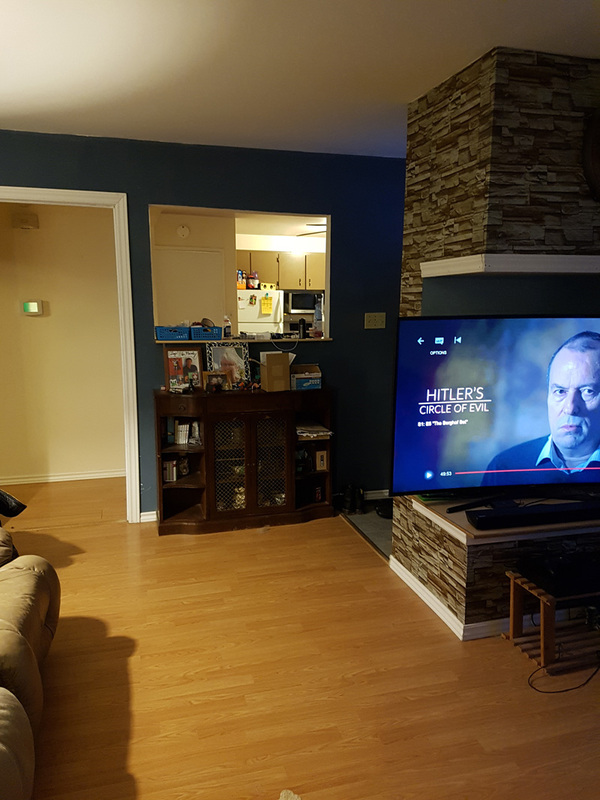 It took us a few days and they took over our living room. 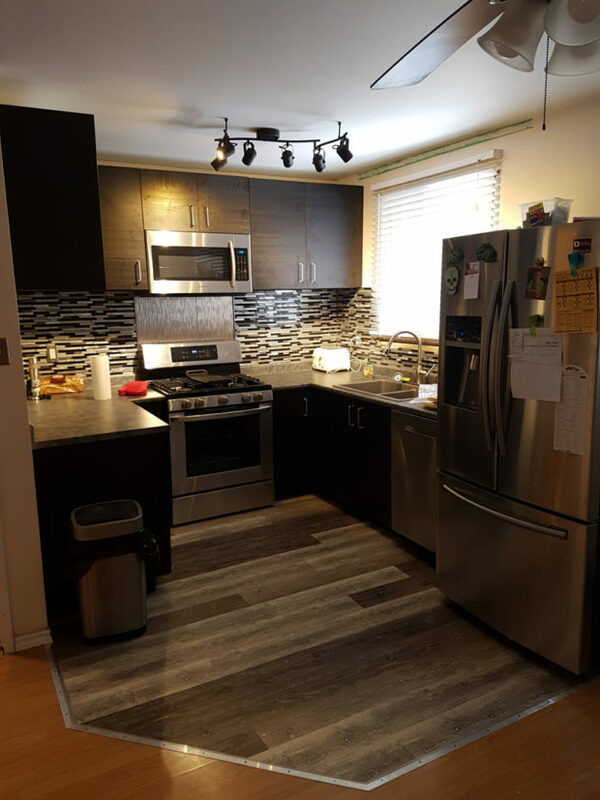 We had also decided to get all new appliances, so we worked with the deliveries on that. And of course things never go totally smooth. Our fridge had a dent on the freezer drawer door, and The Brick wanted to replace the whole fridge instead of just the door. So that was a big fight with them, and eventually when the delivery guys came to bring in the new fridge and take out the old, they ended up just swapping the doors, which worked out for us. So then living room work got done. 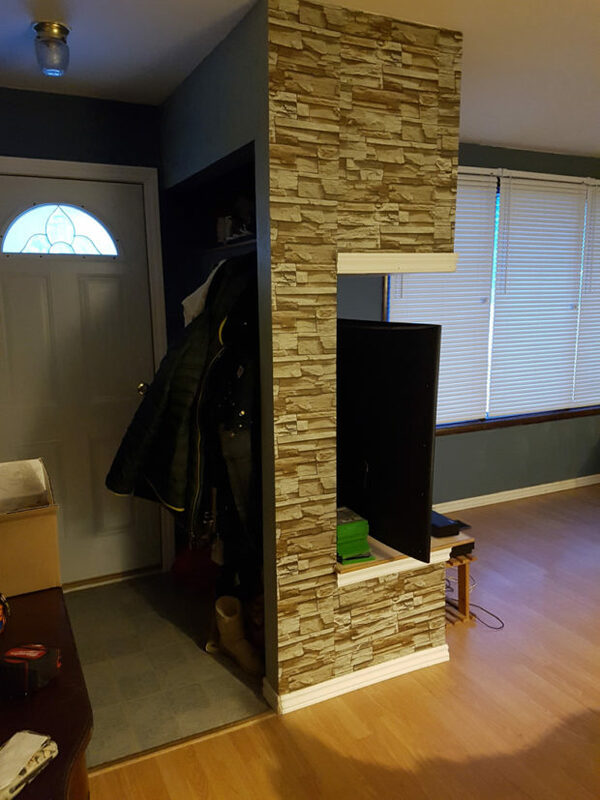 The built in was taken out, and the diving wall taken down. 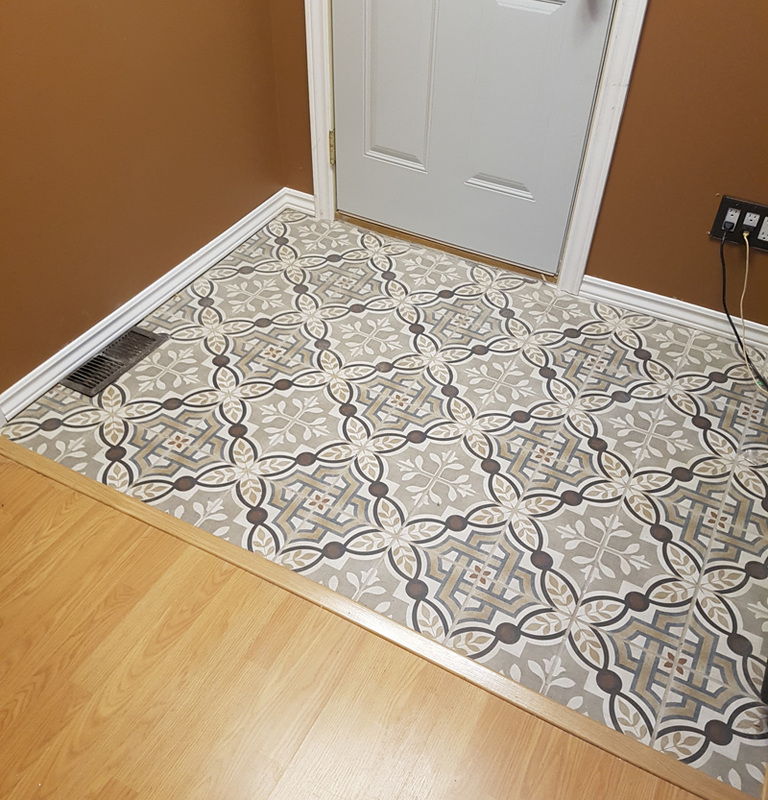 And we put in lovely new tile by the front door. 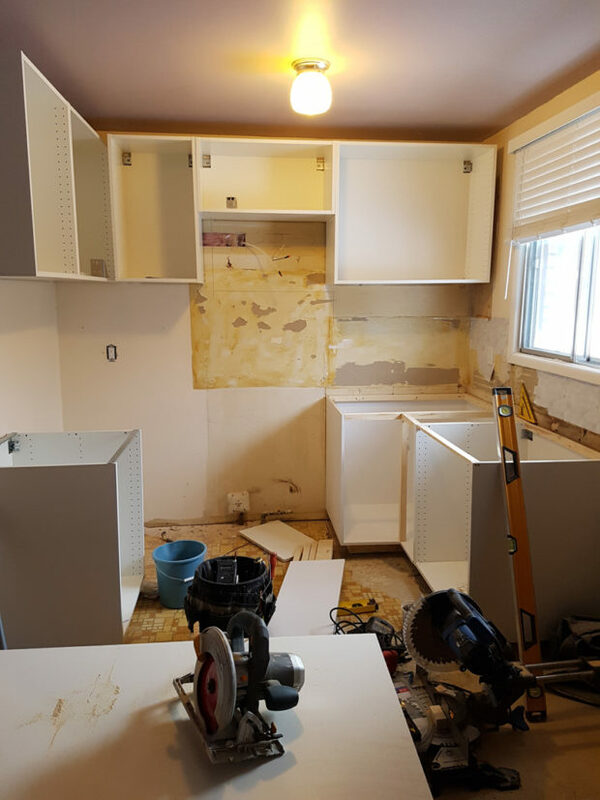 This work was done before the kitchen, but we the doorway became a holding area for cabinets and such, so I didn’t take pics til after everything else was done. 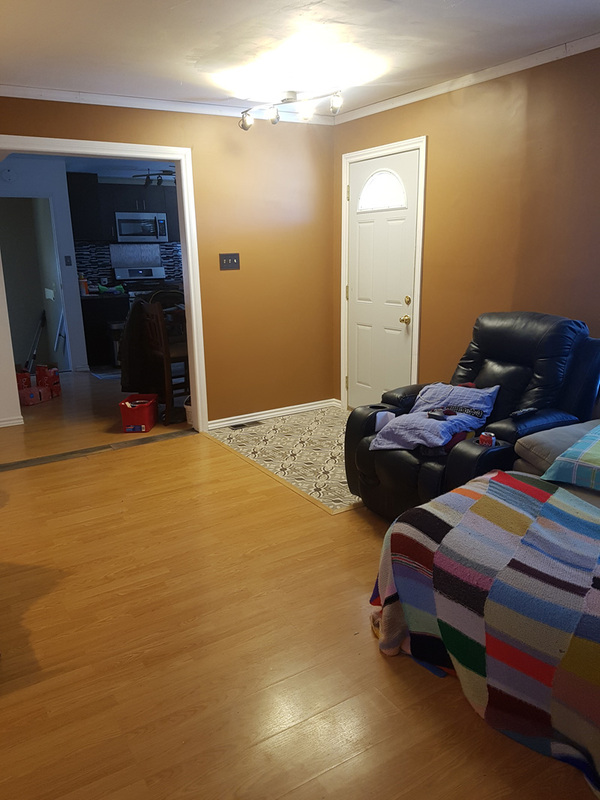 Plus we painted the living room a nice warm brown, with a dark brown accent wall. I like to say it looks like a peanut butter cup. After that it was kitchen time. We were gutting it right down, even new flooring. And apparently there was 3 layers of linoleum laid on top of eachother. We had planned to be without our kitchen for at least a week, so luckily we had some easy to reheat meals prepared. The first night was reheated chili in a crockpot, which was setup on a work bench. Things progressed at a pretty good pace, and each time I came home from lunch or after work I was impressed at the work getting done. And our countertops were another adventure in things not going smooth. When they came in there was some damage to part of it, so they wanted measurements of the cuts to see what they would have to reorder. We lucked out and the piece we needed for our side coffee station area worked out to be the piece they could reorder. But unfortunately when the pieces we picked up the were ALL cut to the wrong size. 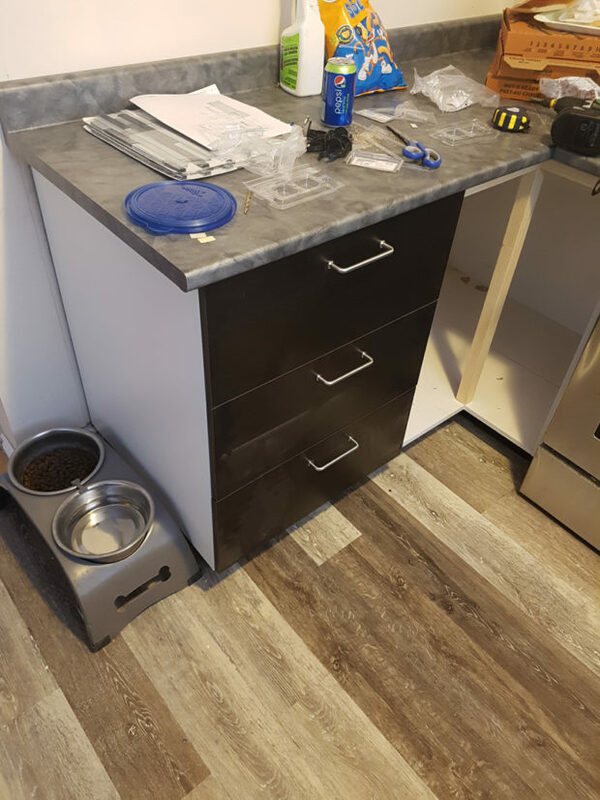 Luckily our contractor managed to adjust the cabinets to make them fit. 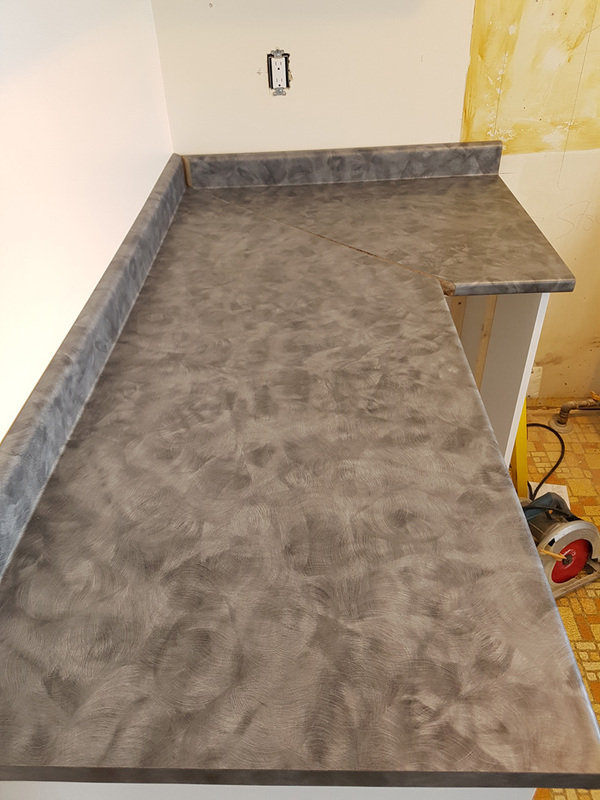 I would not recommend using Universal Countertops locally. How can you cut every single piece wrong? They were all too big. But at least the countertop looks nice. We even got a nice gray stone since to match the rest of the kitchen colors. It was one of the only things we bought at Home Depot. We ended up getting pretty much everything else at Lowe’s. Overall the renos moved along really fast and were mostly done in about a week or so. And the doors and hardware really brought the overall look together. After that point it was just little stuff. 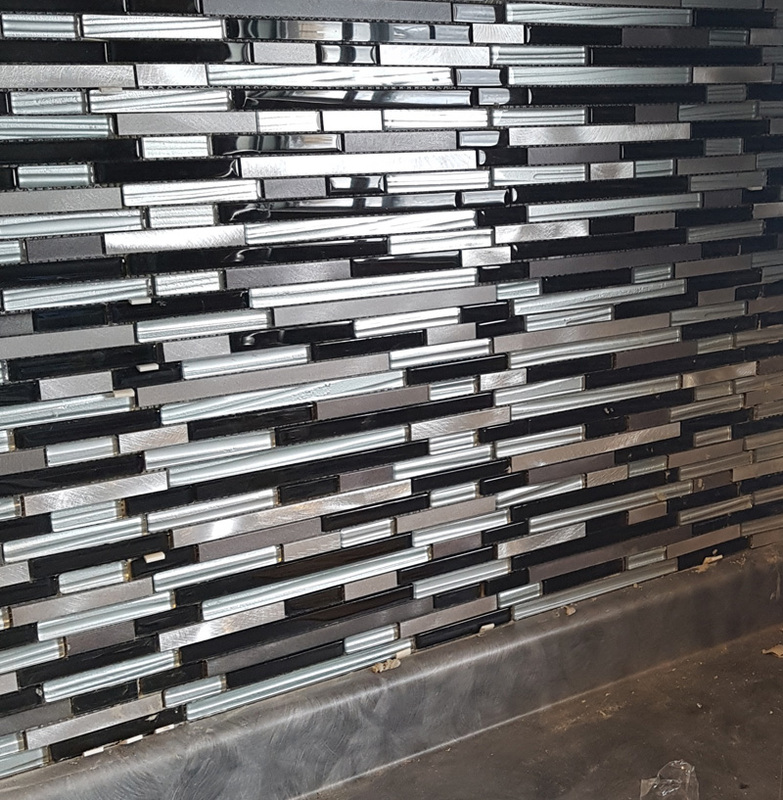 First we got the backsplash done. I initially didn’t want to pay extra money for it, but the tile we wanted ended up on sale and it was just easier to pay the contractor to install it, rather than struggle with it ourselves. Plus it’s really nice. The last big struggle was with our over the range microwave, which we had also bought at The Brick. One of the mounting holes in the back had the threaded piece which the bolt goes into missing from it. It had fallen inside. So that was another call to them. This time they put it thru warranty so we had to wait about a week for the replacement. 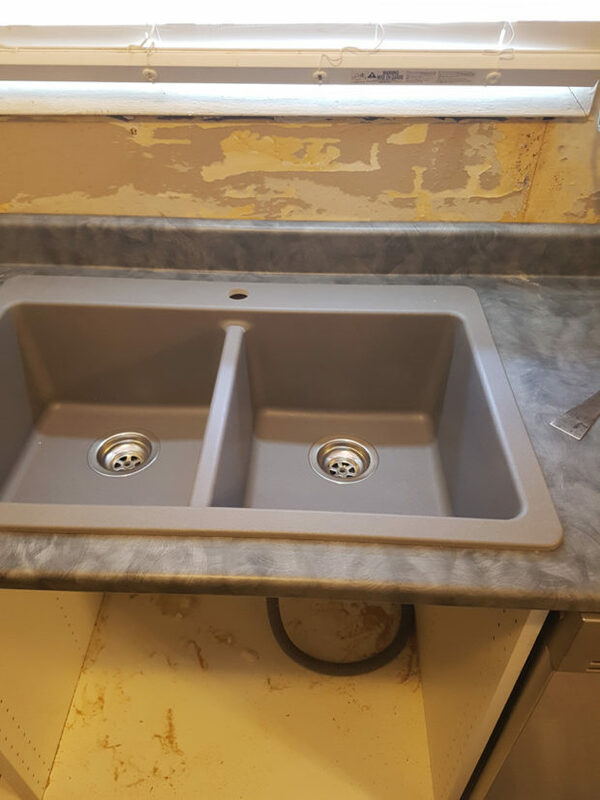 But it came and was installed and finished off the kitchen. 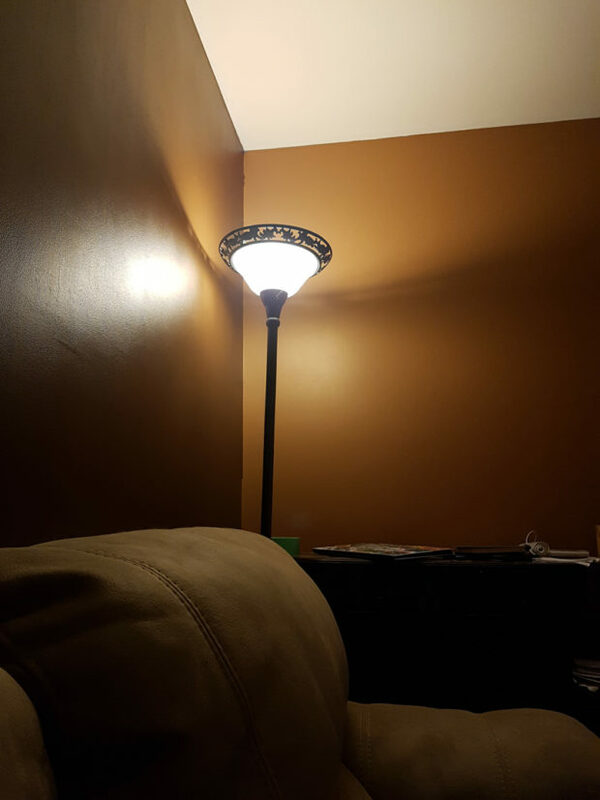 We even replaced the ceiling light with a nice track light. 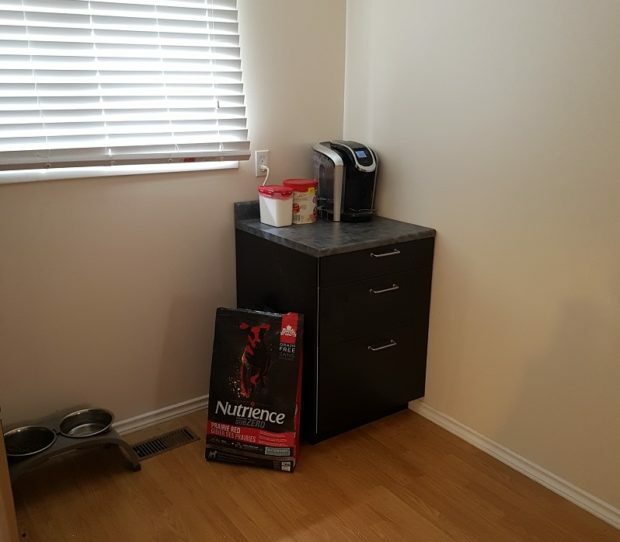 Oh, and we have this cool coffee station, with storage for our dog’s food. 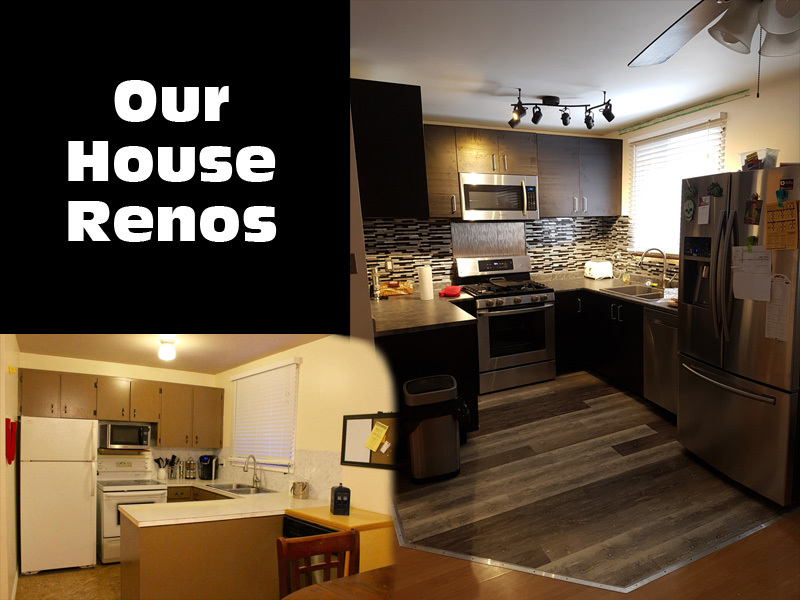 For the amount we spent on it, which was a little over our initial estimates, we couldn’t be more happy with how it turned out, and likely increased the value of our home by way more than we paid for the renos. Plus it’s a bit nicer to have a total custom kitchen that we designed. The last part of our renos was my studio, like I had mentioned, but I will blog about that when it’s all set up and ready to podcasted in.